With the introduction of the 6.7L engine in 2007.5, Holset configured the turbocharger with its latest in variable geometry turbine technology, or VGT for short. This system is electronically controlled by the engine’s computer and provides exceptional response coupled with impressive horsepower. 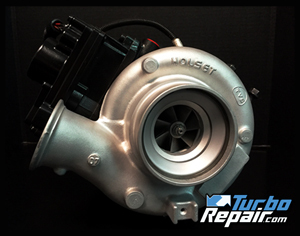 TurboRepair.com is dedicated to providing you with a comprehensive rebuilding service to provide OEM performance and reliability of your turbocharger unit. Each of our rebuilds consists of replacing all the bearings and seals with 100% USA made components, installing a brand new HOLSET actuator that is calibrated with HOLSET software, new HOLSET speed sensor and includes all the needed gaskets, seals and hardware for a trouble free installation. Questions? Give our friendly staff a call, we will be happy to help!